I don't deny that having to stand stoveside frying 30 teaspoons of ricotta at the end of dinner is a slight drawback, but these are so good, I really do think it's worth it. Besides, there's no getting around it. Somehow, that makes things easier for me. I just accept what has to be done, and get on with it. I wouldn't want to have to get up in the middle of some formal dinner and start deep-frying (or maybe I would; escape can be appealing for both host and guest at those sorts of gathering), but when it's just a case of your friends sitting around a table, it's not such a big deal. Go easy on the drink over dinner, though. Put the ricotta and eggs into a bowl and beat until smooth. Add the flour, baking powder, salt, cinnamon, sugar, and vanilla extract. Beat the mixture to make a smooth batter. Fill a wide, shallow pan with about ¾ inch of oil. Heat the pan of oil until a tiny blob of batter sizzles when dropped into the hot fat. 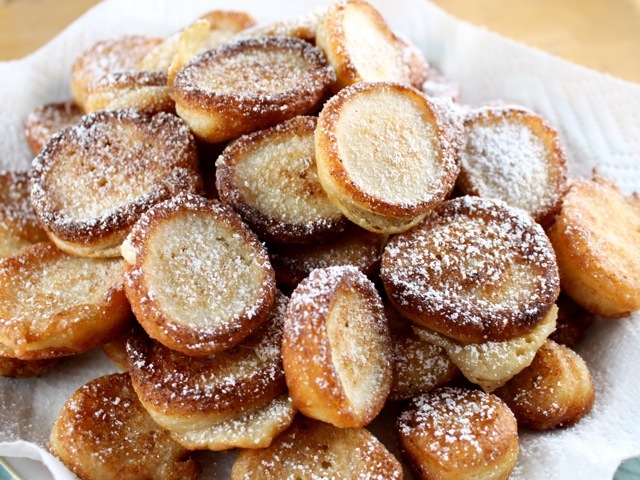 Drop rounded teaspoons of the ricotta batter into the pan, about five or six at a time. Don't be tempted to make them bigger, boring though this is; they will puff up on cooking. You need to turn them over quite quickly, so it's best to do a few at a time. You don't want to get too frantic around all that hot fat. As they turn a golden brown, flip them over and leave them for a minute or so on the other side. As you lift them out of the pan, place the cooked baci di ricotta on some paper towels, just to remove the excess oil. Then pile the balls of heat-bronzed ricotta on to a plate in a rough-and-tumble pyramid shape, and push the confectioners' sugar through a small sieve evenly but thickly over them. Eat straightaway.